Back to back race weekends last weekend and this weekend. I won Friday’s Heart of the South 515 mile race just missing the course record only five days after placing 25th in a strong Pro/1/2 field at the inaugural Fort McClellan road race last weekend with lots of strong teams visiting Alabama from around the country as part of the national criterium calendar kickoff event (Sunny King) in Anniston. I raced that race RAAM-style meaning I left my house at 3AM and rode the 80 miles to the start of the race, raced the race, and then afterwards rode home a longer way going up and over Mount Cheaha for a grand total of 255 miles of racing and riding. There is so many great things I could say about that race — primarily getting to see a lot of friends from the racing community that I haven’t seen much this year because of my RAAM (Race Across America) training, but in the interest of time I’m going to skip straight to how the Heart of the South race went down this weekend. Friday was a beautiful day – I rode my bike to and from Samford to teach my Friday classes as usual (16.6 miles round trip). Later in the day, my awesome crew of Michael Staley and Payne Griffin drove over to my house so we could pack up everything for the race. Side note – huge shout-out to my rookie crew of Michael and Payne. Those two guys did an amazing job of anticipating my needs for food, drink, and bike supplies. Plus, they did a good job of staying awake for a really long time as well as keeping me awake late in the race when I hit my sleep wall. Thanks guys!!!! Side, side note – huge shout-out to my sponsors as well. Raymond James has been behind me financially and helping to get the word out to other companies and individuals who might be interested in joining our team. My Martindale wheelset was amazing again this year. I’m excited for the new Carbon Clincher wheels Philip will be getting me for RAAM – easily shave hours (if not at least half a day) off my total time! No matter how the Race Across America turns out this summer, I will have gotten a chance to explore some absolutely amazing parts of Alabama. Since January, I’ve ridden 24 rides of at least 100 miles (23 Alabama ones shown in the map below). I wanted to create this map because of my ride on Tuesday where I found myself unexpectedly riding in a new county – Coosa County – for the first time. These rides have been in three different states and 29 different counties. Here’s a quick recap of my three most recent epics. Last Friday, I rode to the start of my son’s baseball game, watched the game, and then rode all the way out to Cheaha and back (218 miles and 17,000 feet of climbing) to make it back just in time for the start of my son’s Saturday morning baseball game, watched the game, and then rode 10 more miles to practice having to start riding again after a long break. Along the way I broke my speedplay pedal and had to be rescued by my lovely wife Kristine. I swapped out the pedal and finished the ride. It’s no secret that I think Alabama is the most beautiful place on earth. Other places are nice to visit, but when it comes to sheer diversity, variety, and accessibility Alabama is the perfect compromise between the ruggedness of western states (i.e., inaccessible) and busy-ness of the eastern states (i.e., roads everywhere) and a climate with four very distinct seasons that still allows for year-round riding. Everywhere you look in Alabama there is some hidden beauty to be found – and riding a bicycle is the perfect way to find it. Birmingham itself is a microcosm with steep ridges covered with roads where one can easily ride 100 miles within a 10 mile radius of your house only reusing one or two roads on the entire route. The history of Alabama, though, isn’t quite as pretty. The city I live in (Hoover) was founded as white people left Birmingham in droves during the Civil Rights movement of the 60s fleeing “over the mountain” and founding the suburbs of Homewood, Mountain Brook, Vestavia Hills, and Hoover. Today I’m happy to report that Hoover itself has become more diversified with my kids’ school consisting of 50% white, 37% black, and 13% hispanic (source – AL dept of education 2014-2015 school year). The people of Selma, Alabama played a key role in the Civil Rights movement, but it is one of the few cities in Alabama I had never been to — that is until Tuesday when I decided to do a 310 mile (500 KM) loop that included Selma at its southernmost point. 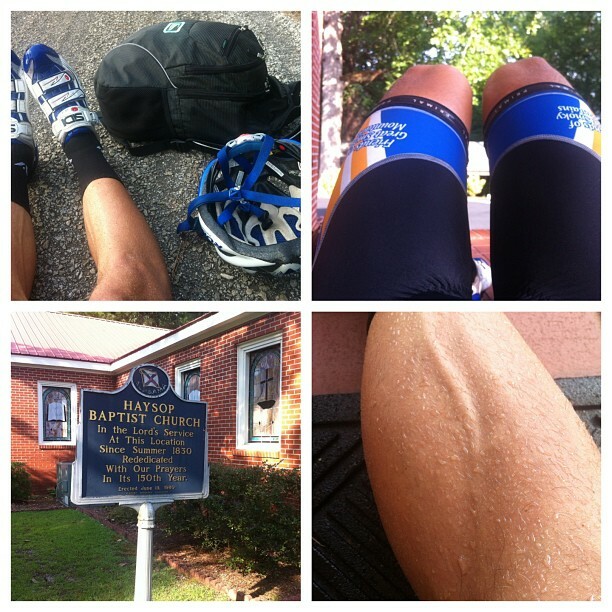 Along the way, I routed myself through several personal history spots key to racing RAAM this year – including one spot two summers ago where I laid down on the stoop of a 185 year old church severely dehydrated and out of water and thought that it wouldn’t be a bad place to die even though I knew I wasn’t quite that bad off … yet. Here’s a pic collage from the church and a video of me begging water off of strangers a couple miles later after I got moving again. Every year I look forward to Rouge Roubaix and coming down to this unique corner of Louisiana and Southwestern Mississippi. The race itself has everything you’d imagine in a spring classic like Paris-Roubaix or Ronde van Vlaanderen (Flanders) – from strung out fields barreling down dirt roads at 30mph to tactics of making a break, chasing a break, or figuring out the run-in to a tricky sprint at the end of the race. No matter how experienced you are, it’s impossible to come away from this race without having learned something new about bike racing and/or yourself. Each category (even beginner) races the full distance of 100+ miles covering about 15 miles of gravel/dirt roads and some paved roads that are significantly harder to find a good line than the dirt roads. After the neutral section, there were a couple short-lived breaks. I was working my way to the front when I saw an opening and a rider about to attack. I hopped right on his wheel and we quickly got a gap. Three more riders bridged up to us, and our break of five quickly got a gap on the rest of the peloton. I thought this break had a good chance to survive all the way to (and possibly through) the first dirt section – but alas, we were chased down a few miles later after making the right-hand turn off of LA-66. This past Sunday was the training race series finale with a 100KM race ending with a steep 1 mile cat 3 climb to the top of Chandler Mountain. I had a four day block from the end of last week until Tuesday of this past week where I rode 586.9 miles with 73,087 feet of climbing. I had a pretty light load the rest of the week, and I wondered if I would be recovered enough for the race. It didn’t really matter, though, because the weather was absolutely beautiful and I was able to enjoy a shorts / short sleeved jersey ride all the way to the start of the race. Annotated topocreator map of the race and the route there and back again (click to enlarge). I’ve updated the topocreator.com elevation profile using a higher resolution dataset to get the full 3005 miles of the course. Plus, I turned on the box gradient feature. The box gradients are drawn into the profile and show ALL climbs and descents of at least 1 mile in length and a 5% average grade. Inside the box is the exact length of the 5% section of the climb, the exact grade, and the vertical difference between the start and end of the climb (or descent). Click on the image below for a 8500 pixel version of the profile. Your browser will probably load the image in a window by itself and then scale it down to fit on the screen. You may need to click on the image itself again to zoom in to see full detail. To get this to work, I rewrote the entire algorithm in Java so that it could run on a real machine rather than the virtual machine hosting the web server. The profile creation took only a matter of a couple of minutes … most of which was transferring the megabytes of data back and forth between the web server and my home system. The Camp Sumatanga training race series put on by GS Montagna Rossa of Birmingham has been a stalwart of early season racing for the Alabama cycling community for many years. Bill Seitz and his crew of GSMR teammates do an excellent job putting on this race year after year. For the second week in a row, the weather was not very cooperative with an annoying light misty rain for most of the day. At least this week, though, it wasn’t quite as cold with temps hovering around the upper 40s most of the day (and night). I timed my ride to the start pretty well picking a 75 mile route that included Walker Gap and Chandler Mountain (if time allowed). I was running a little bit ahead of schedule so I went ahead and climbed Chandler Mountain at a very easy pace to kill some time before the race and to see the climb one more time before we race it for real at the finish of next week’s training race. By the time I finished the climb and headed back down to the camp for the race, I had just enough time to pay for the race, sign the waiver, and roll to the start line. Wow, it took a lot of computing power, but this morning the elevation profile I had started for RAAM yesterday finished. Part of the reason it took so long is that my algorithm scans for the highest and lowest point as well as all gradients along the route greater than 5%. This may not sound too difficult, but finding the exact starting and ending points of a hill allowing for smaller downhills to be included in the hill if the general slope is still up … is very difficult. To make it feasible, I had to filter the entire route down to 5000 data points or roughly one data point every km which is why the total length is shortened by almost 45 miles. So it looks like the total climbing for RAAM will be somewhere in the neighborhood of 150,000 feet of climbing for the 3005 mile route or roughly 4 times flatter than my normal riding. The profile below doesn’t show the gradients because I thought it would be too hard to see them so I checked “hide gradients”, which still does the calculations but doesn’t draw them on the map. Hopefully, I’ll have an updated version by tomorrow that has what I call “box gradients” — i.e., a box drawn around the climb with the vertical diff and average gradient. One of the challenges I face with RAAM is that I am a racer at heart – road, mountain bike, cross, alley cat – you name it and I want to race it. But I am also an adventurer who loves to explore roads, routes, and trails that might be terrible for training but great for adventure. While these long adventures may be great training for RAAM, they are not ideal for regular racing – i.e., starting a race with nearly 500 miles in the legs for the week before the race begins is about as opposite of “tapering” as you can get. But I’ve made the decision that it is worth the sacrifice of a single season of racing to really dive into RAAM and give it my best shot at actually winning the race. The only people right now who really grasp this are the awesome cycling friendly folks at Raymond James Birmingham, Philip Martindale at MC2, and a bunch of my friends. What has surprised me, though, is that my first two races of the year have gone pretty well even with all the miles in the legs – I’ve already ridden 3700 miles this year and climbed halfway to the International Space Station. I think the low intensity nature of my training means that my aerobic engine is pretty big with plenty of high-end muscle fibers available for quick bursts and shorter sustained efforts since they aren’t being stressed that much in training — even if it hurts like hell during the race. I had great weekends of racing both this past weekend (GSMR Camp Sumataunga Training Race #1) and two weekends ago (the Union Grove Time Trial). Both weekends also involved epic pre-race and post-race rides with friends at the races. This past Sunday I placed 4th in the 50 mile training race that came after a fun four county 65 mile adventure with Justin Prior exploring the unique geology and topography of Sand Mountain – i.e., we climbed a ton. 65 mile preride with Justin, lots of great rouge roubaix roads. I got some sort of nasty stomach bug yesterday and was forced into a day of rest off the bike. Hopefully it won’t come up (pardon the pun) during RAAM, but it will be interesting to see how I can persevere through that if it happens. Does anyone know of any good anti-nausea meds that are USADA legal I can take during RAAM? Because I was off the bike, I had a chance to start working on one of our logos, probably the basis for the kit design. Don’t miss out on getting your company’s name on this awesome map. It will look even better in the finalized version! Contact me at brtoone@samford.edu about sponsorship. Or check out our sponsorhip page to learn more.